Since time immemorial, people in all parts of the world used different methods to preserve food and various other items to be used later. Depending on the weather and environment of the region, they dried, salted, pickled, iced and smoked the imperishable items. Preservation of things began when humans had to deal with calamities such as famine, flood, warfare etc. It was also easier for sailors, soldiers, merchants and pilgrims to carry their own food to faraway places. With the advent of modern technology, storing imperishable items is no longer a strenuous task and it can be done on small and large scale. There are cold storage buildings and warehouses that can store tons of items and preserve them for months. What is Cold Storage Building? When things are left in the open, chemical decomposition occur and it slowly gets decayed. But the decomposition process is slowed down significantly when we keep them cold. A cold storage building works on the similar principal – it is like a refrigerated building that is designed to store temperature controlled or frozen materials. These refrigerated warehouses allow you to set multiple temperatures based on the products’ nature and decomposition. For example, a medicine may require it to be stored at a specific temperature and a food item should be stored in a different temperature. Getting your favorite fruit in the off-season is not a wonder anymore and a lot of big business relies on cold storage building to supply for the demands of the customers. Apart from food items, cold storage building can also store candles, artwork, plants, lipstick, cologne, medicine etc. Cold storage warehouse can be big or small depending on the size of your business. While designing your refrigerated building, it is important to keep in mind that it should be equipped with optimal placement of ducting, piping and other lifelines to ensure that the whole system operates efficiently. The infrastructure should be designed in a way that it is easy for renovation and expansion in the future when the business grows rapidly. Maintaining temperature stability and energy efficiency in cold storage warehouse requires a good insulation system. There are lot of methods are used for insulation. Cold storage warehouses are built using steel, wooden or concrete panels. The insulation techniques could differ depending on the raw materials used for the building. The refrigerated system should be designed to maintain cleanliness as it is place where food items are stored and processed. The construction technique should ensure elimination of recesses and crevices to prevent bacteria growth and the possibility of water stagnation is reduced. 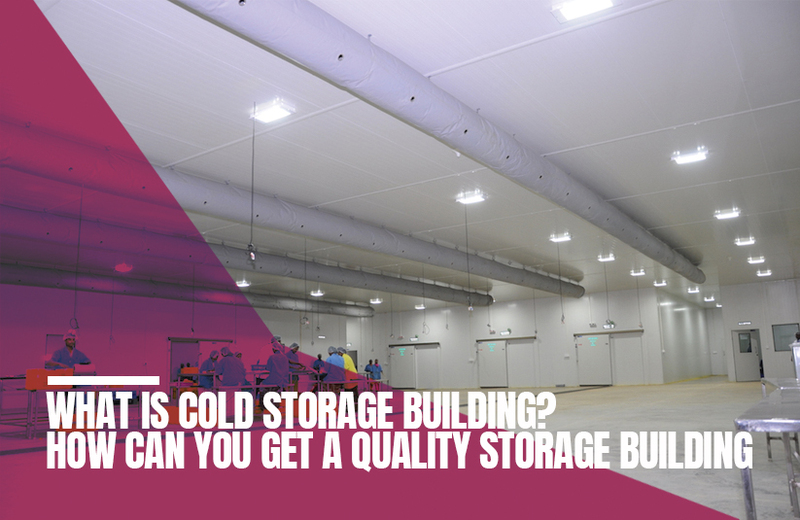 How Can You Get A Quality Cold Storage Building? Cold storage is essential today for a lot of industries. favorite industry, pharmaceuticals, Petrochemicals, and even high-tech electronics require cold storage facility. The frozen food market is expected to grow significantly in the upcoming year. To find the best quality cold storage manufacturer, you must check if the construction has the following facilities. A cold warehouse requires multiple temperature zones to keep various products. A modular Pre-engineered wall system is an effective method to deal with multiple temperatures. The building should have automated point solutions to reduce operational costs. For large scale business, palletizing was a major challenge. With the advent of robotic technology, palletizing has been automated which is cost-effective and productive labor. The technology has enabled palletizing to be done inside the freezer without using protective heating shrouds, thus minimizing the handling of goods by manual labour in sub zero temperature. Look for a cold storage construction company that provides approved cold storage services in accordance with the set industry standards. Ensure that the cold storage warehouse is built using quality material, adapting latest technology with the provision for expansion and renovation. If you are looking to develop your business whether big or small, a cold storage warehouse will be necessary to store your goods for longer and meet customers’ demands. Find the right cold storage warehouse construction company and start growing your business.